Chelsie: The Capital hotel is located in the heart of fabulous Knightsbridge, and is one of London's original boutique hotels. To put into perspective just how good the hotels location is, from the Capital's front doors you can see the iconic department store Harrods. For those guests looking to explore London, it could not be any easier with a host of attractions incredibly nearby, including links to public transport. My favourite attractions in the immediate proximity are the impressive Harvey Nichols, Sloane Street which is widely regarded as 'a shoppers paradise' boasting an array of designer stores and the famous Hyde Park. Personally; I think the Capital Hotel stands out because of the heartwarming story that stands behind the very foundations of this charismatic hotel. David Levin first opened the hotel 40 years ago; and is still running the hotel with the help of his daughter Kate. From the moment you step into the hotel; staff loyality and enjoyment at working at this hotel is evident. This loyalty is combined with a truly British design, creating an ambience that is rarely found in London today and is truly a credit to the Capital hotel. 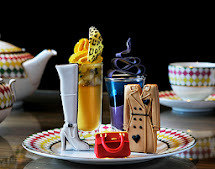 Kate: The Capital hotel is known for designing innovative afternoon tea's inline with current social events around the city. In celebration of the London 2012: Olympic Games a special sporting afternoon tea has been designed to perfectly capture the very essence of the games! Taking into consideration that the Capital Hotel has recently been awarded the prestigious 2012 UK Tea Guild's award in recognition of their outstanding quality and consistently high stands in tea service; this was one afternoon tea we could not afford to miss out on! Afternoon tea is served daily in the sitting room which is a combination of quintessentially English elegance and soothing intimacy. We were welcomed by Cesar the bar manager, and shown to our perfectly made up table. The afternoon tea menu available at the Capital is extensive with four different champagne options; Champagne-Jacquart, Bellini, Jacquart Rose and N.V Bollinger. Alongside the champagne options, a vegetarian and gluten free option is also available to ensure every pallet is pleased. Chelsie and I decided that in light of the worldwide celebrations of the games; we would celebrate too with the Champagne-Jacquart afternoon tea! Chelsie: On making our selection, we were then offered a glass of either chilled still or sparkling water as we waited for our champagne. Our afternoon tea arrived on a three tier stand; and I could not resist smiling as I saw Kate's eyes light up when we realised the stand had two tiers of delicious looking pastries and cakes. On the stands arrival we were talked through the afternoon tea format. The bottom tier contained the following crustless sandwiches on different breads: smoked Scottish salmon with cucumber and lime creme fraiche, free range egg with mustard, roast chicken with lettuce and tuna mayonnaise with spring onion. The middle tier and top tier contained two of the following highly imaginative mini masterpieces; dumbbells made with passion fruit ganache in a Valhrona chocolate shell; a Winners’ podium made from glazed lemon sponge; Valhrona chocolate buttons on poppy seed and ginger sable biscuit sporting Medals; a Flame made from banana cream rippled through with a raspberry coulis and adorned with a white chocolate flame decoration; and a Basket Ball glazed carrot cake. I can honestly say the food was incredible, each tier was truly faultless. The sandwiches were the best I have ever tasted, being incredibly delicate and fresh but also so very flavoursome. My favourite sandwich was the smoked salmon with lime creme fraiche, although I was a little dubious initially the lime creme fraiche really boosted the salmons flavour. Kate and I agreed, although a very close call our favourite cake was the banana cream flame. Trust me, when you try it for yourself your see exactly why! Kate: On completion of our sandwiches, we were then presented with freshly baked scones which were still warm from the oven. The scones smelt heavenly, and I was instantly reminded of my childhood when I would bake with my mother. 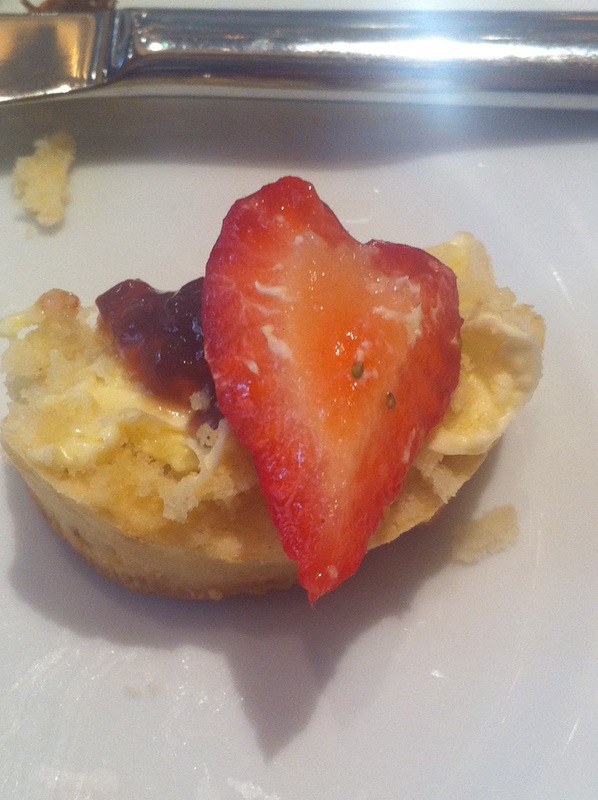 I must say the taste of the scone is truly maximised when warm, and then accompanied with the raspberry preserve, clotted cream and fresh strawberries your guaranteed to enjoy every bite. Chelsie and I had previously ordered our tea to arrive with our food. The Capital prides itself on being quintessentially British, so understandbly tea is integral. The tea selection is vast and detailed, but thankfully Cesar is incredibly knowledgable and full of advice when you are making your selection. I choose the 'Bohea' tea which has a deep taste and aroma of Scotch and Chelsie selected 'Silver Needle' white tea which is made from the finest spring buds of the Da Bai Plant. As we sipped on our tea, and enjoyed our food we were given a respectful air of privacy yet a watchful eye was maintained in case we needed assistance. Chelsie: Kate and I really enjoyed our afternoon tea experience at The Capital Hotel; the whole experience was faultless. The creativity behind the food, alongside its heavenly taste, attentive service, beauty of the setting and fabulous location really created a timeless experience for us to enjoy. If you are in London for the games, and looking for an Olympic themed afternoon tea; look no further as this has been our favourite to date. The menu at The Capital Hotel regulary changes; helping to ensure that your experience will always be different. 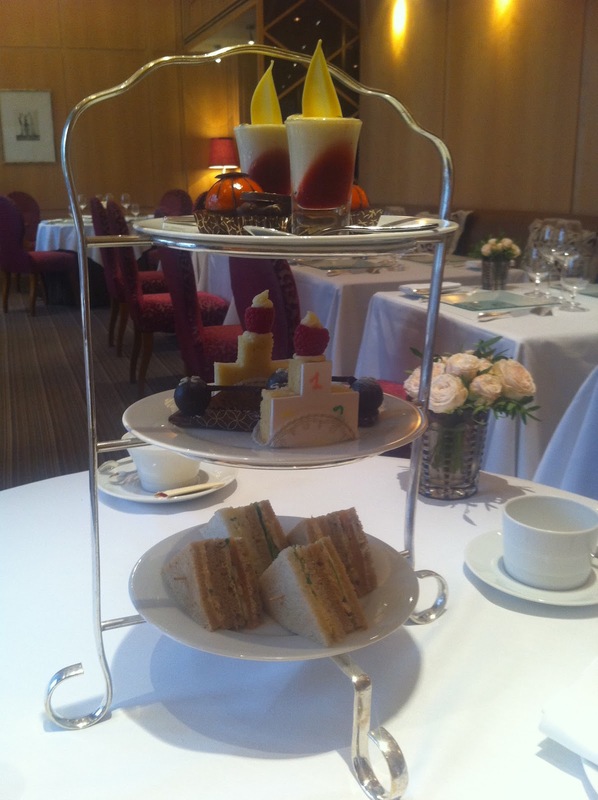 In light of this The Capital Hotel afternoon tea is perfect all year round, and not just during the games. Kate and I would also recommened afternoon tea at The Capital for baby showers, hen nights (to get the celebrations going) and Birthday celebrations. We promise it will be an unforgettable experience! Thanks so much for visiting our site and your kind comments! Hello, I really enjoyed to read this but i think some tips that i really want to share with you are with the online system you can browse the different online hotel booking available in the area, and see if they have only a discounted price or if they will allow you to create your own price. This may sound strange, but especially during off peak times many hotels want people to spend something to stay in their rooms to help increase their annual revenue.